The countryside around Listowel, north Kerry. A thunderstorm swept across Pittsburgh in the early morning hours of Aug. 22, 1923. Winds gusted to 35 miles per hour and dropped the temperature to 51 degrees before daybreak. The thermometer barely had reached 60 degrees as Nora Foran Scanlon set off for a notary’s office about a mile from her apartment in one of the city’s Irish enclaves. The murder of John Foran was one of over 100 killings associated with the Land War. Nearly 100 agrarian murders occurred in Ireland from the start of the Land War in 1879 through the conclusion of the Parliamentary special commission on “Parnellism and Crime.” This story explores the viciousness of the period by looking at the case of one family. The murder of boycotted farmer John Foran caught the attention of newspapers and Parliament and echoed up to the founding of the Irish Free State. Nora Foran had grown up near the North Kerry market town of Listowel, about eight miles southeast of where the River Shannon empties into the Atlantic. Knocanore Hill, an 880-foot summit isolated from Kerry’s taller southern mountain ranges, is another area landmark. Then, as today, the district is dominated by farms and bogs. The Foran family were from Listowel, north Kerry, where they farmed a 150 acre lease in the Tullamore townland. Nora’s father, John Foran, had grown up there, too. He’d been in his early twenties when a potato blight and English indifference triggered Ireland’s Great Famine. He’d seen widespread starvation and death as Kerry’s population plummeted 18 percent between 1841–1851. Property records for 1851 show John Foran (either Nora’s father or his father) was farming a 150-acre lease in Tullamore townland, about five miles north of Listowel on the east side of Knocanore. Foran leased the land from John Benn-Walsh’s estate of nearly 9,000 acres, which had been acquired from the 3rd Earl of Kerry in the early 1770s. The estate included another 2,200 acres in neighboring County Cork and holdings in England and Wales. Benn-Walsh was a British politician and the first Lord Ormathwaite—taking the name from his County Cumberland property in northwest England. His North Kerry estate was larger than most, but dwarfed by a handful of others. Foran’s farm was among 1,900 acres in Galey civil parish, where Ormathwaite maintained his mansion Tullamore House and a smaller residence called Duagh Glebe, a few miles east of Listowel. The Foran’s farm was a large sub-lease within the 1,900 acre estate of Lord Ormathwaite. Omathwaite considered his purchase of Coolaclarig opposite Tullamore to be “a very good investment,” according to his surviving journals. In 1858 he hired George Sandes as local agent for his properties. Sandes was a North Kerry native and lawyer, but the agent position made him very unpopular among the locals. An eviction during the ‘Land War’ of the 1880s. Despite massive Famine-era emigration from the area, Kerry retained “in a great degree its peculiar and characteristic features,” Irish lawyer and author William O’Connor Morris wrote to The Irish Times in October 1869. Ten years after he penned those words, O’Connor Morris was in Kerry again, this time as a county judge. By then landlord-tenant relations had taken a turn for the worse, compelling him to speak out against the rising tide of agrarian violence as well as efforts by Parliament to ease the tensions by giving peasants more proprietorship of the land. The Nation newspaper lamented the ‘rigor and severity’ with which the Ormathwaite estate carried out evictions. The Nation newspaper singled out Ormathwaite and his agent Sandes when it detailed “two evictions of a very distressing nature” in an October 1868 story. Under the headline “The Crowbar Brigade in Kerry,” the story lamented the “rigor and severity of with which the law of evictions is carried out in this country.” Complaints about Ormathwaite and Sandes increased in years to come. John Foran was part of the emerging Catholic middle-class of middle to large tenant farmers and urban traders who were the primary benefactors of agricultural prosperity following the Famine, Donna Sean Lucy says in his 2011 book, “Land, Popular Politics and Agrarian Violence in Ireland: The Case of County Kerry, 1872-1886.” Kerry was fast becoming a profitable center of dairy production, with some of the county’s best grazing land surrounded Listowel. As the value of the land began to rise, landlords sought to increase rents accordingly. The rent hikes tended toward a disproportionate, adverse impact on smaller tenants. Landless farm laborers also were losing employment opportunities to increased mechanization. Thus the seeds of agrarian unrest were sown. In 1879, poor weather, a minor potato blight, and a cholera outbreak among chickens created panic, and the local economy once again became depressed. Renewed calls for land reform blended with efforts to introduce more domestic political autonomy in Ireland— Home Rule, which was championed by Charles Stewart Parnell and other members of the Irish Parliamentary Party. 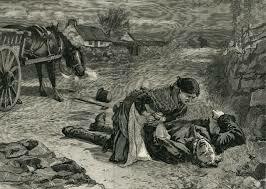 The Land War saw over 4,000 ‘outrages’ a year at its height, some 10% of which were in Kerry. When the Irish National Land League began a campaign of ostracism against a County Mayo absentee landlord’s local agent, Captain Charles Boycott, a new term—boycott—was coined to describe the tactic of refusing to have business or social relations with such agents or others. Boycotting became a popular form of civil rebellion and often was aimed at those of the same religion and social class. Secret societies, historically known as “moonlighters” initiated nocturnal terror attacks ranging from the posting of threatening notes (signed by Captain Moonlight) to maiming farm animals; and from brutal beatings to murder. The combination of political and agrarian agitation, aimed at securing the position of tenants and eventually land re-distribution, with passive and sometimes violent resistance to evictions became known in Ireland as the Land War’. 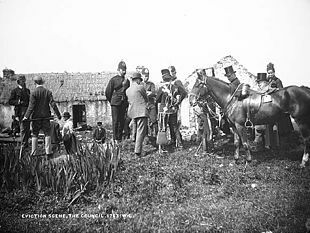 Royal Irish Constabulary (RIC) reports of “agrarian outrages” escalated from 236 such offences reported in the whole of Ireland in 1877 (with eight in Kerry) to more than 4,400 violent episodes nationwide in 1881. Nearly 10 percent were in Kerry. The absentee landlords also attempted to control courtroom outcomes in land dispute cases through influencing judicial appointments. Lord Ormathwaite’s agent, George Sandes, was a magistrate in Listowel. Jeremiah Maddigan was evicted after falling behind on rent owed to large sub-tenants of Ormathwaite, including John Foran. The July 17, 1880, edition of the Kerry Evening Post details a dispute on Ormathwaite’s Tullamore property. Jeremiah Madigan, a sub-tenant, fell behind in his payments to several of the large farmers on the estate, including John Foran, and was evicted. The Post reported that Foran had filed a claim against Madigan for more than £34 of debt. He dropped the case in exchange for promissory notes, including an £8 payment. About that time Ormathwaite’s eldest son and heir Arthur John Walsh became the second Lord Ormathwaite when his father died on Feb. 3, 1881. The younger Walsh had already begun borrowing heavily against his anticipated inheritance. It wasn’t long before he was mortgaging the estate properties to pay debts. Foran also acquired the farm of Thomas Walsh in 1883 after he was evicted for falling into arrears. As a result, he was boycotted. What is not in dispute is that residents of Coolaclarig, Tullamore, and Listowel began to boycott Foran and his family as a consequence. Local newspapers report several instances of friction between Foran and the community. The family’s problems even were discussed at Parliament in London. Under the headline “A Boycotted Farmer and his Calf” the April 8, 1884, edition of the Sentinel noted Foran had the day before ventured into Listowel to sell a calf and was “accompanied by the two policemen who are protecting him.” It reported, “Several persons went through the form of buying the calf but it was evident from the amount of money which they offered, that they had not the remotest intention of buying it” by offering less than half the animal’s worth. Frustrated, Foran sent the calf “by another person” to sell at the nearby Ballylongford market the next day. The next month, Foran was in court alleging that one of his foals had been “maliciously killed and wholly destroyed at Coolaclarig” shortly after he obtained the farm from Walsh. He “swore he knew very well that his foal was captivated into the ditch by some moonlighters,” the Sentinel reported. As magistrate, Sandes dismissed Foran’s complaint and suggested the foal must have accidentally fallen into the ditch. Later that summer, Listowel residents complained to government authorities in Dublin about extra scrutiny in the district, including the special police protection for Foran. Dublin responded that local residents had been told to stop boycotting Foran, but “the warning had however no effect.” Local officials disputed that Foran was being boycotted at all, with one suggesting he “only wants to be refused” as an excuse for the police protection. As the new year began, Foran was back in court but this time as a defendant charged with attempting to sell three firkins of “fraudulently prepared” butter at the Listowel market. Dennis Sheehan testified he bought the butter “from the defendant’s little girl,” but quickly found that the firkins were filled to “within an inch of the top with butter of an inferior quality—it was like butterine.” Foran said he was “not aware” the butter was of inferior quality. One of the three magistrates hearing the case denounced such tricks saying, “And only for a few persons who have little character, the market would be run down altogether.” He demanded that Foran receive “the highest penalty the law would allow.” Sandes was one of the other two magistrates. They agreed and imposed a fine of £2 for each firkin, plus court costs. A year later, the Sentinel reported that Foran and his daughter Nora were at the Listowel Petty Sessions regarding a December 1885 incident at the Listowel market. They claimed to have been harassed while trying to sell a firkin of butter and asked the court to bring an intimidation charge against John Daly. A depiction of roadside murder during the Land War. Daly’s defense attorney brought to light Foran’s conviction and fine for “selling fraudulently prepared butter” in December 1884. It also emerged that Daly had been in court testifying against Foran in that instance. When she was called to testify, Nora Foran said the potential buyer pierced the butter to take a small sample, then turned away. “As if he didn’t like it,” Sandes said from the bench, “and then somebody cried out that your father was boycotted.” “Yes, sir,” she replied. When, by 1886, Ormathwaite had mortgaged his estates for £153,755 and even still his debts continued to rise, pressure increased on Sandes to secure higher rents from his tenants. As a consequence, Sandes found himself the target of a boycott and receiving the same treatment as John Foran, his tenant. But Sandes fought back using his power as a magistrate to threaten business licenses. Due to his own debts, Ormathwaite raised the rents on his estates – leading to the boycott of his agent, Sandes. With the wet summer of 1888 Ireland’s grass crops flourished, which increased dairy production, and boosted livestock prices. Farmers like John Foran began to recover from the economic slump. Yet he remained boycotted. That is why he traveled more than 16 miles to Tralee on Sunday morning, July 29, to secure laborers. As he returned that afternoon, at the reins of a horse-drawn cart, his 15-year-old son, Michael, sat next to him up front with a young girl—Kate Sullivan—who had been offered a ride. Three laborers crouched in the back. The road at this point is bounded on either side by a thick copsewood of fir, larch and shrubbery, extending a distance of considerably over a mile, and affording ample and secure shelter for the perpetrator of a deed of blood. Not a house is to be seen within a radius of a mile, nothing but trees and shrubberies are discernible on either side of the road, the entire place presenting a scene of loneliness and solitude, and wearing a darksome and somewhat awe inspiring aspect even in the day time. The place also has a reputation of being ghost haunted, the alleged spectre being supposed to be that of a man who hanged himself there many years ago. During this heightening of tension in north Kerry, John Foran, the ‘land grabber’ was ambushed and shot dead. Suddenly, a man emerged from the woods, jumped into the road from a low stone wall at the side, and holding a revolver in one hand, seized the horse’s halter. “Clear the car,” he ordered. And without giving the travelers time to comply, the ambusher—taking deliberate aim at Foran—discharged four shots into the farmer’s body, according to the Sentinel. “The unfortunate old man on receiving the shots fell forward from the car on the road, and was instantly a stark corpse,” the story continues. “The assassin, satisfied that his fell work was complete, lost no time in returning into the wood at the same point where he had emerged from, and suddenly disappeared through the trees.” The three farm laborers and the girl fled in terror leaving the now orphaned little boy to his own resources. Unable to lift his lifeless father into the cart, Michael put him up against the wall and drove to Listowel, where he contacted authorities. The murder was widely reported across the United Kingdom and in America. Even the most brief accounts took note that Foran was a boycotted farmer. Within days the authorities made three arrests. When the suspects were brought out to the yard with a number of other men and placed in line for the purpose of identification, neither Michael Foran, Kate Sullivan, nor the three laborers were able to identify any as Foran’s killer. The prisoners were discharged. James Curtin, a 23-year old labourer was arrested for the killing. In mid-August police arrested, James Curtin, a 23-year old labourer described in press accounts as “extremely poor.” When the Crown said that none of the five witnesses would be called to testify in a coroner’s inquest, the jury refused to bring a verdict of willful murder against “any person or persons unknown” unless witnesses were produced. Michael Foran testified about his first encounter with Curtin after having identified him as the killer in a police lineup. 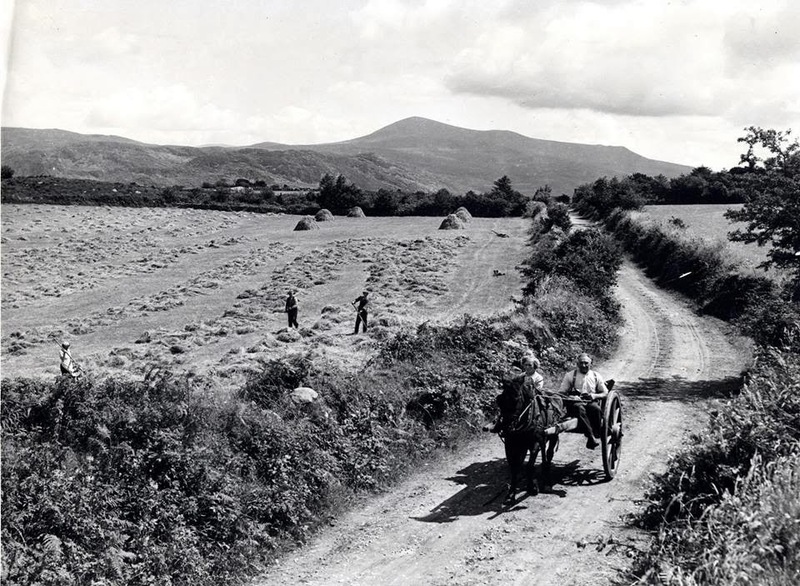 He, his sister Joanna, and younger brothers Tim and Dennis were bringing a churn of milk in a cart from the Coolaclarig farm to Tullamore, a distance of just over a mile. Curtin stopped them on the road, pulled the churn from the cart, spilled the milk, grabbed the churn with both hands, and gave it “nine or 10 welts against the road,” smashing the container, he said. “My father wanted me to go to the court against Curtin, but I was frightened of Curtin and I would not,” he said. Michael Moriarty was the first of the three laborers called to testify. He said he heard “Clear the car” or “Quit the car” as he saw a man leap from the side of the road and begin to fire shots. But it was “a very small sight I got of him,” Moriarty said, and he would not identify Curtain as the shooter. Possibly due to the intimidation of witnesses, the trial against Curtin collapsed. Kate O’Sullivan, the young girl who took a ride from Foran, said she was turned from the front of the car and did not see the shooting. When the spring court session resumed in March 1889 after a four month recess, the Crown abruptly ended the Foran case by entering a notice of nolle prosequi against Curtin. The prosecutor did not give a reason. The prosecutor refused. Curtin was released. But the Foran murder continued to ripple through other legal proceedings and politics, including the special commission hearings in London on “Parnellism and Crime.” Foran is among nearly 100 land-related murders documented by the inquiry. The Foran murder also became fodder in anti-home rule political handbills in three by-elections during 1891. The Foran murder also became fodder in anti-home rule political handbills in three by-elections during 1891. This was shortly after Parnell’s infamous affair with Katherine O’Shea became public and the Irish Parliamentary Party split into factions for and against the leader. On May 13, 1889, John Foran’s personal estate was settled at Limerick for his son, William. The “effects” were recorded at £559, or about 10 times the annual lease at Coolaclarig. That is equivalent to about £55,180 today or about $83,000.00. The 19th century amount has a 21st century “relative prestige value” of £411,200, or $624,427.00. After the death of her father, Nora Foran suffered from her drunken brother, beat her and squandered the family’s inheritance. “He struck me more than once, and dragged my head. He said I should not be selling the butter. He is squandering all our means. He is in the habit of taking drink, and assaulted me before in several ways by throwing articles at me. The judge said Nora had no legal right to sell the butter, but he could not forget that she was abused by a drunken brother. He said he was unmoved that William Foran was being boycotted, but he was sympathetic to the needs of a working farm and reduced the sentence by one month. How long Nora remained at Tullamore with William, or what happened to the rest of the family, gets murky at this point, in part because 1891 census records were pulped during the First World War. A surviving Catholic Church record shows that Nora married Jeremiah Scanlon on June 4, 1895, at Moyvane parish, about six miles east of Tullamore. The couple quickly left Kerry and within a day or two boarded a ship to America and were living with two children in Pittsburgh at the turn of century. Nora Foran married and left for America. William Foran abandoned the farm due to ongoing intimidation. The Scanlon family lived in an area dominated by Irish immigrants, many of whom had arrived from the southwest counties of Kerry, Clare and Cork after the Great Famine. For Nora, it would have been prudent to keep secret her family’s notorious background. She likely avoided Kerry gatherings of Irish county associations—a self-imposed ostracism rather than being boycotted by others. Back in Ireland, William Foran abandoned the Coolaclarig farm due to ongoing intimidation. The acreage remained fallow for more than 10 years, with constables assigned to protect the landlord’s caretaker. During this period the British government attempted to rectify the problems of the Land War period through passage of the Irish Land Act of 1903 and the Evicted Tenants Act of 1907. On Oct. 18, 1909, Richard Cherry, attorney general for Ireland, informed the House of Commons that Thomas Walsh had been reinstated to Coolaclarig. The former tenant would buy the property for £762 advanced to him under the Land Purchase Act and repaid by an annuity of approximately £25. In addition, Walsh was given a £120 grant for the purchase of livestock. Like many other Irish immigrants, Nora Foran Scanlon followed the 1916 Easter Rising, Ireland’s War of Independence and Civil War as a new American citizen. Her oldest son was killed during this period in World War I. The transition from to the Irish Free State from British control seem to have prompted her in March 1922 to begin seeking redress for her father’s murder. Over the next three years she would write to officials on both sides of the Atlantic. “The treatment my father and family received has always been a great sorrow to me,” she wrote in one of the letters. Mark Holan is an Irish American journalist. He can be contacted at newsmark@hotmail.com. The National Archives of Ireland, Dublin, and the National Archives and Records Administration, College Park, Maryland (near Washington, D.C.), contain numerous letters from Nora Foran Scanlon to U.S. and British government officials regarding the July 1888 murder of her father. The letters are dated from 1922 through 1925. The files also contain replies to the victim’s daughter, and detailed Irish Land Commission memorandum of the case, including the 1883 eviction of Thomas Walsh. I have viewed these records in person and have copies. The boycotting of John Foran, his murder, its aftermath and the eventual reinstatement of Walsh are detailed in Hansard, the official report of U.K parliamentary proceedings, from 1886 to 1909. Online search. Foran’s troubles are also well-detailed in the Kerry Sentinel and other local and national newspapers of the day, which are attributed in the story. Online and microfilm. 100 agrarian murders: From the “Appendix to Evidence of the Parliamentary special commission on ‘Parnellism and Crime,’ ” and “Events connected with the Administration of the Law and the Agrarian Agitation in Ireland during the term of office of the Right Hon. A. J. Balfour, M.P., as Chief Secretary, with short references to his Speeches on Irish Affairs.” Part I, August 1887, to end of year 1890. Viewed at the British Library. John Foran and Nora Foran grew up in North Kerry: Based on news accounts, and baptismal and marriage records via irishgenealogy.ie. “The Landowners of Ireland,” Compiled by U. H. Hussey de Burgh. Dublin Steam Printing Co., Dublin 1878. National Library of Wales, Ormathwaite Estate Records. John Foran (victim or his father) at Tullamore: 1851 Griffith’s Valuation shows. “one of the most shocking murders…”: “Events connected with the Administration of the Law and the Agrarian Agitation in Ireland during the term of office of the Right Hon. A. J. Balfour, M.P., as Chief Secretary, with short references to his Speeches on Irish Affairs.” Part I, August 1887, to end of year 1890. Viewed at the British Library. The Foran murder also became fodder in anti-home rule political handbills: “Leaflets on the Irish question” 1891. LSE Selected Pamphlets. Retrieved from JSTOR. John Foran’s personal estate was settled at Limerick: Calendars of Wills and Administrations 1858-1920, via the National Archives of Ireland. boarded a ship to America: Passenger record via The Ellis Island Foundation. The couple’s final destination was Chicago. living with two children in Pittsburgh at the turn of century: Nora and Jeremiah Scanlon are recorded living in the city in the 1900 U.S. Census, along with two sons born in Chicago. The family continued living in the same part of the city, in different apartments, in the 1910, 1920 and 1930 U.S. Census. The family is also recorded in Polk’s City Directories for Pittsburgh during the 1920s at addresses that match those on Nora Foran Scanlon’s letters about her father. The Scanlon family lived in an area dominated by Irish immigrants: “A Fanatic Heart” : The Cause of Irish-American Nationalism in Pittsburgh During the Gilded Age, By Victor A. Walsh, “Journal of Social History, Vol. 15, No. 2 (Winter 1981). Oxford University Press. 3 Responses to "Nora’s Sorrow – The Murder of John Foran, 1888"